If you have any questions or want to enquire about dates, use our form to contact Frank McClintock or see their website for more information. Up a 4km dirt track which the adventurous will love, and hugging the shore of one of the Alentejo’s largest freshwater lakes, the Quinta and its garden are simply the best for birdwatching and wildlife with masses of wild flowers in spring. Frank’s eco-friendly renovation of the original low house took years and then a row of guest rooms was added. These are pleasingly simple, with pictures, books, terraces and lake views. Breakfast, lunch and supper – all home cooked by Daniella are served in the big extended living room and bar which has a warm, informal feel. Beyond huge windows (open to the sky except in winter) is a vine-covered terrace; further butterfly-bright terraces brim over with hibiscus, oleander, palm, jasmine, plumbago, cactus. Frank planted the garden specifically to attract birds and wildlife so book a tour (he is southern Portugal’s expert) or sit quietly in one of the hides. Walk down the garden to the jetty where you’ll find boats and kit for canoeing, paddle boarding, fishing; swimming here is sublime and warm for most of the year. You’ll also find a newly-built yoga shala overlooking the lake. This is a place of peace and much beauty – and star-filled skies on clear nights. Special offer: We're offering a 20% discount on accommodation for any reservation of 7 nights or up until the end of October. There's never been a better time to get away! Minimum stay: 2 nights. 4 nights in high season. Christmas, 1 November - 28 December, 4 January - 15 March. Lunch €15. Dinner €22.50. Wine from €10. Restaurants 35km. Singles €90-€130. Extra bed/sofabed available €25 per person per night. Set in a lovely garden, surrounded by birdsong, with the lake as a backdrop, this guest house with excellent green credentials, is a great place to relax completely away from it all. Frank and Daniela are excellent hosts. The rooms are simple, clean and comfortable and the home cooked food consistently good. 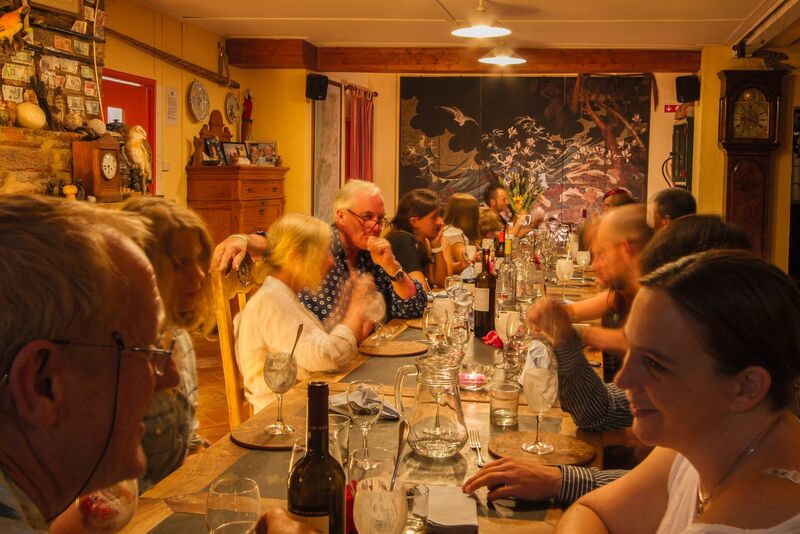 Evening meals are taken communally - a great way to socialise. P in P is also the home of Birding in Portugal and many of the guests were birders like us. Frank is a knowledgeable bird guide. His varied tours were excellent and provided a huge variety of birds. A wonderful stay. An incredibly special place! The setting is beautiful; so peaceful and remote. Frank and Daniela make you feel straight at home; the convivial dinner was a highlight, as was taking a paddle board out onto the lake and feeling totally connected to nature. I can't wait to return! The location is sublime - beautiful terraced gardens on the side of a hill with plenty of places to sit and admire the view of the lake. The food is unbelievably good (with a great wine list) - especially when you consider our party consisted of one vegan, one vegetarian and one slightly fussy vegetarian 11-year-old. Frank is a superb bird guide, and we went out for four days with him seeing many different habitats and birds. There are canoes and paddle boards to take out on the lake. The hotel is quiet and peaceful and Frank/Daniela are wonderful hosts. Can't recommend highly enough. We enjoyed staying in this beautiful natural garden hillside retreat. It was the quietest place I have ever been. Daniela is a wonderful hostess and our meals were delicious. The staff was friendly and fun. We enjoyed dining with the other guests at the large table and made new friends that week. One becomes family staying here. We came to birdwatch. Frank was an excellent guide and we explored the plains to the east and the coast to the south-west. He knows where to look for target species! Great Bustards, Yes! Black & Griffon vultures, Yes! We NEVER go back to a place we have been before BUT we made an exception for the Quinta and returned to a most beautiful, peaceful and friendly holiday spot. Frank's birding knowledge is superb and the hospitality is just right. Dinner en famille; trips to see birds if you want to go; water sport if you want to stay around, or just be in the sun, soaking up the traquility. It's a special place and one I hope we will be able to return yet again! I’ve been coming to the Quinta since 1990(!) and there are a few reasons why... this has become one of my truly happy places on the planet; as soon as you arrive you cannot help but feel relaxed. The scenery is stunning, but the Quinta is so much more than a gorgeous lake and some lovely views. When you enter you become part of the fabric; part of the family. From family breakfasts on the terrace to entertaining dinner party style evenings, Frank, Daniela and all the crew make you feel incredibly welcome - a home from home. This is my second visit this year & I’m already planning the next one! An amazing location high high up - 5kms along a winding dirt track through forest - to arrive at a comfortable place to stay overlooking a huge lake where you can swim, canoe and paddle board. Book on a birding tour with Frank - he's a total expert but also a hoot - and has planted a wonderful garden specifically to attract birds. Daniella cooks good food and you eat with other, international, guests so conversation is lively. You can do yoga too. My husband and I spent an incredible 4 days at Paradise in Portugal (September 9th thru 12th). Frank, Daniella and the entire staff went out of their way to make us feel exceptionally comfortable and at home. 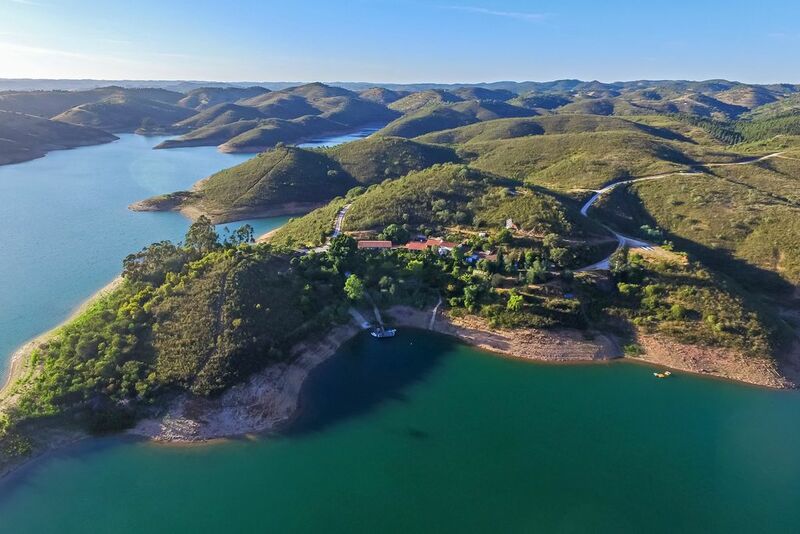 Paradise in Portugal is in a remarkable location, 4 kms off the grid, overlooking a beautiful lake and beautiful plants surround you. We stayed in the honeymoon suite which has a private veranda. The place is wonderful and the meals were exceptional. There are opportunities to swim, kayak, sail or just relax looking out at the unbelievably beautiful surroundings. One word, GO!! We drove from Lagos to Paradise to meet up with friends who were holidaying with Frank. We were made to feel very welcome immediately and our request to stay over and join them for dinner was immediately organised. The Quinta was truly a dream place. The views, the peace and tranquility, the rooms, the 3 course meal the friendliness of everyone there was an amazing experience. Even Honey the dog made us feel very welcome. I would certainly recommend Paradise in Portugal. We really enjoyed the peace and friendly hospitality of the Quinta, and the excellent home-cooked meals. The lush garden is quite an oasis, and the adjoining lake is perfect for a refreshing dip or paddle on a warm summer's day. The rooms are clean and comfortable, with lots of character. At dinner-time we chatted with interesting people of various nationalities around the table, and enjoyed the ever-changing vista across the lake. Frank is an excellent bird-guide, and knows where to find the avian specialities of southern Portugal. Highly recommended. We've never been on a 'birding' holiday before so didn't really know what to expect .... what we got was great trips out, brilliant guidance from Frank, lots of laughs, and so many 'firsts' we almost lost count. 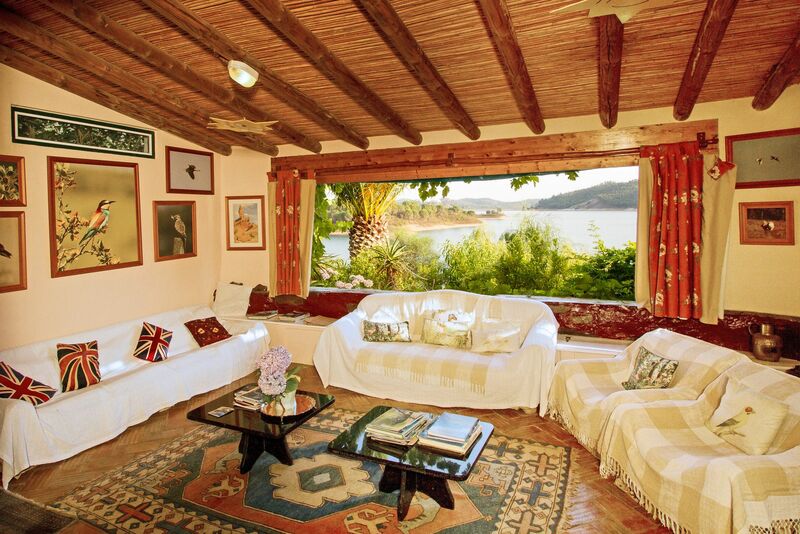 As for Quinta itself, what an idyllic place to stay. We had a charming bedroom with a cat theme which suited us down to the ground, a fabulous bathroom, and own terrace with a lovely view of the lake. We've never stayed in a hotel with such a warm, family feel to it - Frank and Daniela are a very special couple and made us feel part of the family in no time. The most peaceful and beautiful place to get away from the hubbub of city life. We loved the laid back atmospere and the opportunity to talk to other guests from all nationalities round the large dining table. The experience was more like a house party than a hotel, and we were treated to delicious, often home grown meals. Our children loved playing by the lake and walking the numerous dogs. They had no desire to go to the beach or anywhere else during our 8 day stay. This is the most beautiful, unspoilt part of rural Portugal and you don't come here to do anything but stay (unless you enjoy going up and down the dirt track endlessly, in which case you can do that.) Frank's bird tours are legendary and sometimes there will be yoga groups so you could come to find peace in the shala. There are plenty of books to read and maps for walks long and short, strenuous or strollable. All food is provided for you but if you want a change there is a restaurant on the other side of the lake. The village at the bottom of the long track is sleepy and quiet but with two cafes. You are at least an hour away from both coasts and Daniella can give you a picnic lunch. Birdwatching - and nature in general - is our speciality and Frank, the owner, organises Guided Trips throughout southern Portugal for guests at the Quinta. It's an opportunity not to be missed! Canoes and SUPs are all included in the price of your stay - make the most of them and explore the lake's 250 kms of coastline. The fishing is stunning, with Carp and Wide-mouthed Bass being the targets. Swimming in the lake is de-rigeur - at an average temperature of 28º during the summer months it's the ideal place for children too as it's safe with no currents. The surrounding area's full of walking trails and the Quinta can supply you with detailed directions and picnics. There's a total absence of any noise from the outside world; no cars, trains, buses or planes - just the hum of insects and the trill of birds. "Paradise" it's called and it's as near to heaven as you'll ever get! Frank is a maverick - one of those guys who just decides to do a mad thing and does it. So many years ago he bought this wild piece of land in Portugal - totally unterraced and unreachable - piled all his belongings into a red double-decker bus and drove out here. He created the track, the house and the rooms and the wonderful garden. He's made the place very much his own and now shares it with Daniella. He really does know everything that is worth knowing about birds and plenty of other wildlife.